When my wheels need servicing, I'm no wrencher. Vespa electrician, maybe. Read my gear posts and judge for yourself. But expert mechanic? Don't count on me. I don't count on me either. My Italian beauty needed new shoes. Aren't all Italian beauties in perpetual need of new shoes? New fluids were also called for, and I wanted someone with a discerning mechanical eye and nose to match to check up on the transmission and drive train. That means a visit to Canada's number one Vespa dealership. Alex Berthiaume & Fils. You might think "What hyperbole! He's going to the biggest Vespa dealer in Canada to have his Vespa looked after". Let's table the evidence and you can be judge and jury. 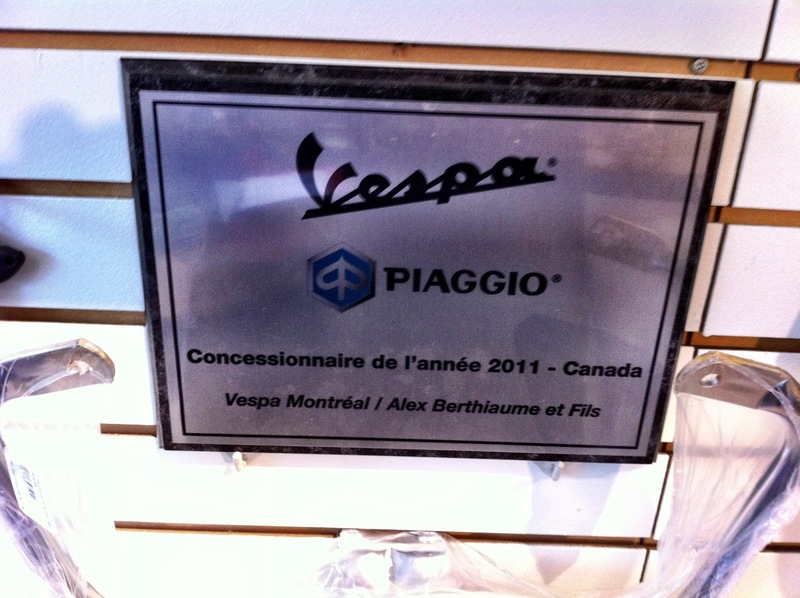 First off, there's the 2011 Vespa Canada dealer-of-the-year plaque in the showroom. Begs the question, doesn't it: do all Vespa dealers in Canada sport that plaque? I call the sales manager as my first witness. Me: "Sur votre site internet ça dit que vous êtes le plus important concessionnaire Vespa au Canada... C'est tu une farce, ou c'est vrai?" Sales Mgr. : "Ben r'garde derrière toi, s'ul mur!" Points to the plaque. Me: "Ben oui... ça veux-tu dire que vous êtes le plus grand, ou juste le plus gentil?" Anonymous reader: "Objection! Badgering the witness." Me: "But your honor, I'm in cross!" Another, more reasonable, anonymous reader: "Overruled. The witness will answer." Sales Mgr. : Looking pensive for a moment, probably dredging sales data. "R'garde on a vendu 150 Vespas c't'année. Les autres concessionnaires sont chanceux d'en vendre 40." Me: "C'est bon ça! Comme ça vous en vendez le plus au Canada?" Anonymous reader: "Objection! Now he's leading the witness." Me: "Your honor, still in cross..."
The other, more reasonable, anonymous reader: "Overruled. The witness will answer." Sales Mgr. : "C'est sûr! C'est pour ça qu'y nous ont donné la plaque!" Looking at me like I'm a little thick. It's not the first time I've cross-examined a witness, and it's not the first time I've gotten that look. Still, your skepticism is justified. What are the odds, that in just two weeks I would be having a chat, on the shop floor, with the largest Vespa dealer in the US (Vespa Sherman Oaks), and the largest Vespa dealer in Canada (Alex Berthiaume & Fils). I said this before, truth is stranger than fiction. 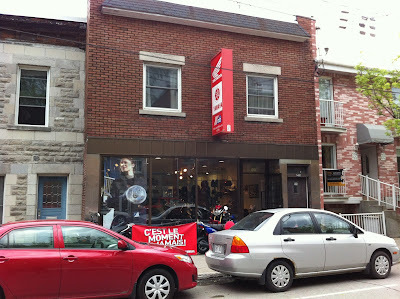 Alex Berthiaume & Fils, the largest Vespa dealer in Canada, is two-and-a-half miles from my office. Getting there on two wheels with a Vespa is a piece of cake, and that makes me a wheeler. A nice leisurely ride through Montreal's Plateau borough, along picturesque Duluth street over to Lafontaine Parc, then a few blocks north on De La Roche Street. Presto! The eagle-eyed nit-pickers among you will notice that's not the Google route in the map above. Google may be efficient, but it has no soul. My route is more direct, and prettier. Once one drops one's bike off, how does one get back to the office? Silly question! On two wheels of course! No I didn't steal a bike. Shame on you! 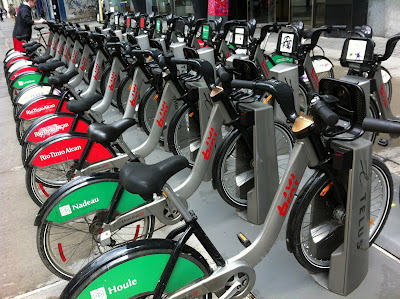 I pulled my bicycle helmet out of the topcase and strolled over to a BIXI stand just down the street on the corner, popped in my founding member's smart key, and off I went, merrily pedaling back to the office. 20 minutes and a little huffing and puffing later, I drop off the BIXI bike at the stand at Stanley and de Maisonneuve, and five minutes later I'm sitting at my desk. A task that was happily repeated when my Italian beauty was ready to be picked up. Speaking of wheels, after I paid up, the aforesaid sales manager cunningly invited me to take a Vespa GTS 300 Super for a spin around the block. Yikes!!!! or to update that expression OMG!!! What a sweet bike! Breathtaking acceleration, nice weight, incredibly well balanced, surefooted, superb silky brakes, nice throaty purr from the motor... and I could go on! And that's just from a spin around the block. I'm working on stuff that I'll deserve to be rewarded for, this I know. And there's a semi-gloss titanium grey 300 in the showroom with my drool on it... Time to put this thread to bed. Man, you are lucky to have a dealership close by. For me it is a forty minute trip to downtown to get to mine. However mine, while certainly not the biggest, has probably the best Vespa mechanic that Canada has to offer, or so I tend to believe when I talk to him. He is a scooter god. Plaque or not... Sales in numbers don't make a good dealership. The service is what counts. I hope that they do well in that department, too. Sonja, Their mechanics are top-notch as well, and they treat your bike as if it was their own. Of course they aren't giving away the service though. Sooner or later my French half was going to intrude here. I kind of enjoyed throwing in the French narrative to see how readers might react, particularly with the dialect thrown in for good measure. Hopefully no one takes offense. Just trying to keep it real-ish. One little pleasant surprise for me was that I immediately felt the difference with the new rubber. Really quite remarkable. why don't you "GO FOR THE GTS SUPER"? Put the YVR airfare towards it and head West. you will never regret it.